Go to original pattern for design DROPS 111-1. 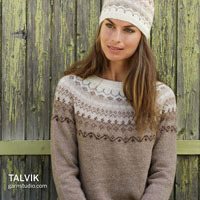 Knitted DROPS jacket with domino squares in ”Fabel”. Size S - XXXL. 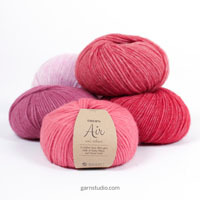 DROPS POINTED NEEDLES size 3 mm – or size needed to get 24 sts x 48 rows in garter st = 10 x 10 cm. Row 2 (= RS): work row until 1 st before marker, slip 1 st as if to K, K2 tog, psso, work remaining sts on row. Row 5: Work row until 1 st before marker, K3 tog, work remaining sts on row. Row 6: Like row 2. Row 8: Like row 2. Row 9: K all sts. Repeat row 1 to 10 until there is 1 st left on needle. 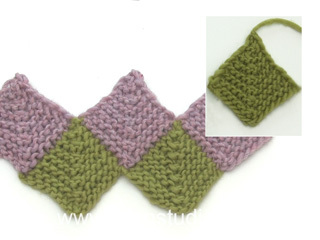 Cut the thread and pull through remaining st.
Row 1 (= WS): Work row until 1 st remain, slip this st on stitch holder-1. Row 2 (= RS): Work row until 1 st before marker, slip 1 st as if to K, K2 tog, psso, work sts on row until 1 st remain, slip this st on stitch holder-2. Repeat row 1 and 2 until there is 1 st left on needle and 33-37-40-43-47-50 sts on each stitch holder. Row 1 (= WS): K all sts, with 10 front band sts in P sts. Row 2 (= RS): P 10 front band sts, K2 tog, work row until 1 st remain, slip this st on stitch holder-1. Repeat row 1 and 2 until there are 11 sts left on needle (includes 10 front band sts) and 33-37-40-43-47-50 sts on stitch holder-1. Make buttonholes on right front band. 1 buttonhole = cast off 5th st from mid front and cast on 1 new st on return row. SIZE S: 23, 28, 34 and 40 cm. SIZE M: 25, 31, 37 and 44 cm. SIZE L: 27, 34, 41 and 48 cm. SIZE XL: 29, 36, 44 and 52 cm. Row 1 (= RS): dec 1 st each side. Row 3: dec 1 st each side. Row 4: dec 1 st each side. Row 5: dec 1 st each side. Row 6: K all sts. Row 7: dec 1 st each side. Row 8: dec 1 st each side. Row 9: dec 1 st each side. Repeat from row 1 to 10 a total of 9-10-11-12-13-14 times = 3 sts left on needle. Work next row from RS as follows: slip 1 st as if to K, K2 tog, psso = 1 st left on needle. Cut the thread and pull through remaining st. Piece now measures approx 21-23-25-27-29-31 cm from casting on row to the top of square. Row 1 (= RS): dec 1 st at the side. Row 2 (= WS): K all sts (continue to P front band sts). Row 3: dec 1 st at the side. Row 4: dec 1 st at the side. Row 5: dec 1 st at the side. Row 6: K all sts (continue to P front band sts). Row 7: dec 1 st at the side. Row 8: dec 1 st at the side. Row 9: dec 1 st at the side. Row 10: K all sts (continue to P front band sts). Repeat from row 1 to 10 a total of 9-10-11-12-13-14 times = 12 sts left on needle. Work next row from RS as follows: K2 tog, cut thread and pull through st created by K2 tog, slip the remaining 10 front band sts on a stitch holder. Piece now measures approx 21-23-25-27-29-31 cm from cast on row to the top of square. Pick up 79-88-96-104-113-122 sts along the side on right front piece (part 1), beg inside front band sts on stitch holder and pick up sts to where the dec at the side of Part 1 started (i.e. 2 cm at the bottom of front piece and back piece are left “open” and will be sewn tog later). Cast on 1 st between front piece and back piece, and pick up 79-88-96-104-113-122 sts along the right side on back piece (part 1) up to the point (= mid back) = a total of 159-177-193-209-227-245 sts on needle. Insert a marker in the middle st (= mid side). Now work Domino square, see above. Beg at the point mid back on back piece. Pick up 79-88-96-104-113-122 sts along the side to where the dec at the side on Part 1 started (i.e. 2 cm at the bottom of front piece and back piece are left “open” and will be sewn tog later). Cast on 1 st between back piece and front piece, and pick up 79-88-96-104-113-122 sts along the side on front piece up to front band sts on stitch holder = a total of 159-177-193-209-227-245 sts on needle. Insert a marker in the middle st (= mid side). Now work Domino square. Pick up 66-74-80-86-94-100 sts (from RS) from the point at the top of Domino square at the right side and down along the edge to where the 2 Domino squares meet mid back, pick up 1 st between the 2 squares and pick up 66-74-80-86-94-100 sts along the side to the top of the Domino square on the left side = a total of 133-149-161-173-189-201 sts on needle. Insert a marker in the middle st. Now work Half Domino square – see above. Keep the 1 st on needle and slip sts from stitch holder-1 and stitch holder-2 back on needle. K 1 row, AT THE SAME TIME pick up 28-30-34-40-47-55 sts evenly among the sts slipped back on needle = 95-105-115-127-142-156 sts. Insert a marker in piece, now measure piece from here. Continue in garter st back and forth on needle on all sts. 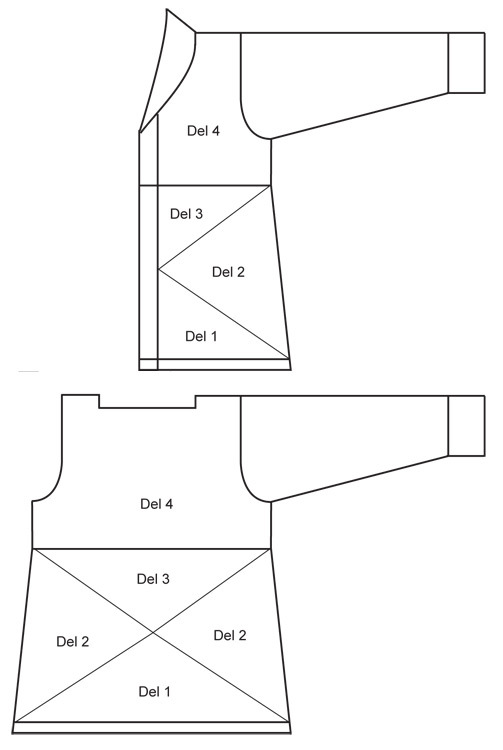 When piece measures approx 6 cm from marker cast off 3-3-3-4-4-4 sts each side for armhole and cast off to shape the armhole each side at the beg of every row: 3 sts 0-0-0-1-2-3 times, 2 sts 0-2-4-4-5-6 times and 1 st 2-2-2-3-4-5 times = 85-87-89-91-94-96 sts left on needle. 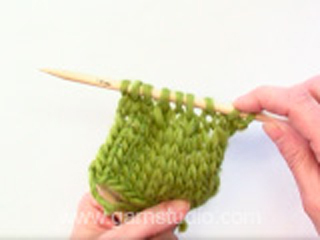 Continue in garter st back and forth on needle until piece measures 23-24-25-26-27-28 cm from marker. 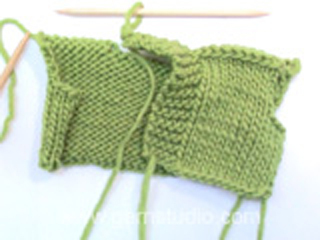 Now cast off the middle 21-23-25-27-30-32 sts for neck and complete each shoulder separately. Cast off 1 st on neckline on every other row a total of 3 times = 29 sts left on shoulder. Cast off when piece measures 25-26-27-28-29-30 cm from marker, piece now measures a total of approx 65-70-75-80-85-90 cm. Remember BUTTONHOLES – see above. Slip 10 front band sts back on needle. Pick up (from RS) 1 st between front band and the point at the side of Domino square, then pick up 66-74-80-86-94-100 sts along the side of the Domino square up to the point at the side of jacket = 77-85-91-97-105-111 sts on needle. Insert a marker in the st between front band and Domino square. Continue to P front band sts on every row. Now work Quarter Domino square – see above. Keep the 11 sts on needle and slip sts from stitch holder back on needle. K 1 row, AT THE SAME TIME pick up 14-16-17-20-22-27 sts evenly among sts slipped back on needle = 58-64-68-74-80-88 sts (includes 10 front band sts). Insert a marker, and now measure piece from here. Continue in garter st back and forth on needle with front band sts as before. When piece measures approx 6 cm from marker cast off for armhole at the side as described for back piece = 53-55-55-56-56-58 sts. Continue until piece measures 25-26-27-28-29-30 cm from marker. Now cast off 29 sts from shoulder towards the neckline = 24-26-26-27-27-29 sts left on needle for collar. Continue in garter st back and forth on needle on collar sts with front band sts as before. When collar measures approx 6-7-7-8-9-9 cm from shoulder, cast off. 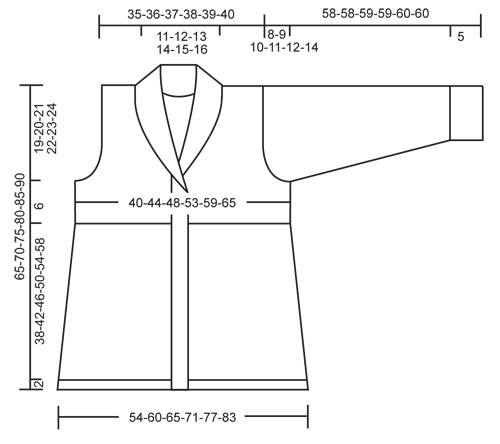 Like right front piece, but mirrored and without buttonholes. Worked back and forth on needle. 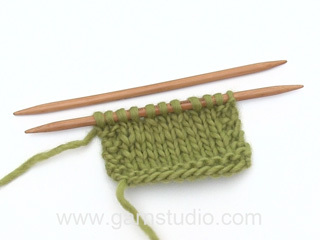 Cast on 56-58-60-62-64-68 sts (includes 1 edge st each side) on needle size 3 mm with Fabel. Work garter st until piece measures approx 5 cm. Work 5 rows stocking st and now continue in reverse stocking st. When piece measures 8 cm inc 1 st each side and repeat the inc on every 3.5-3-2.5-2-1.5-1.5 cm a total of 12-14-15-18-21-22 times = 80-86-90-98-106-112 sts. When piece measures 50-49-49-48-48-46 cm (less for the larger sizes because of longer sleeve cap and wider shoulder) cast off for sleeve cap each side at the beg of every row: 3 sts 1 time, 2 sts 5-5-5-5-5-6 times and 1 st 1-2-4-6-7-7 times, then cast off 2 sts each side until piece measures approx 57-57-58-58-59-59 cm, now cast off 3 sts each side 1 time. Cast off remaining sts. Piece measures approx 58-58-59-59-60-60 cm. Sew side seams and sew tog the edge (= 2 cm garter st) towards bottom edge each side. Sew in outer loops of sts. Sew sleeve seam inside 1 edge and set in sleeves. Sew collar tog mid back and sew to neckline. Sew on buttons. Work next row from RS as follows: slip 1 st as if to K, K2 tog, psso = 1 st left on needle. Danke,für die schnelle antwort,aber ich meinte nicht teil 1 , sondern die Markierung rückenteil/rechtes Vorderteil teil 2. Diese Markierung bleibt bei mir nicht in der Mitte .muss ich den maschenmarkierer immer nach der gestrickten Masche wieder einsetzen,oder zuvor? Liebe Frau Schellenberger, der Markierer muss immer in den mittleren Maschen sein, dh immer in der Mitte von dem Viereck/Dominoquadrat - siehe VIERECK. Viel Spaß beim stricken! Hi, Ich habe ein Problem mit dem Übergang von dem Rückenteil 3 zu Rückenteil 4 . Am Teil 3 sollte ich die letzten Maschen stilllegen und dann an Teil 4 auf die Nadeln tun und Maschen aufnehmen,das habe ich auch gemacht aber jetzt sind die Maschen ganz lang :-(( Auf den Bildern sieht es aber ganz anders aus ,als wenn da eine Biese ist . Liebe Frau Oldörp, Sie können die stillgelegten Maschen verschränkt stricken, oder je den Faden vor der nächsten stillgelgten Maschen heben und mit dieser Maschen zusammenstricken, damit die Maschen nicht zu hoch werden. Viel Spaß beim stricken! Viereck,Markierungsfaden: 2. Reihe vorderseite. wird din Markierung immer wieder versetzt nach dem abheben? Bei mir wandert die Mittellinie immer mehr nach einer seite,was mache ich falsch? Liebe Frau Schellenberger, im Teil 1 linkem Vorderteil wird der Markierer immer innerhalb die 10 Blendemaschen bleiben (= am Ende der Hinreihe). Die Abnahmen werden am Anfang der Hinreihe gestrickt. Dieses Teil soll wie "Del 1" im Skizze aussehen. Viel Spaß beim stricken! Liebe Anita, vergleichen Sie die Maßen von der Schnittübersicht mit einer ähnlichen Jacke die Sie gerne haben, so können Sie die beste Größe finden. Hier lesen Sie mehr über Masse. Viel Spaß beim stricken! Endlich fertig! Die Jacke ist wunderschön geworden und hat mir schon beim Stricken viel Freude bereitet, weil sie so interessant zu stricken ist. Und die trägt sich ganz wunderbar. Ja Sie haben Recht, die Angabe, in welchen R abgekettet werden soll, fehlt, das wird gleich ergänzt. Bonjour Mme Brown, pour toute assistance avec votre machine à tricoter, nous vous recommandons de contacter votre magasin et/ou un forum spécialisé dans le tricot machine. Bon tricot! Skrev en fråga till er för två veckor sedan... Hur lång tid ska man behöva vänta på svar? Hej Ewa, ärmkullen stämmer, men se till at maska av löst! Lycka till! Hej! Är nu klar med första ärmen, men den passar inte alls till tröjan! Ärmkullen är alldeles för låg. Hur kan jag räkna om den så den passar?